Take to the waters for two days and navigate the heart of the south-west Argentina's lake district by kayak, camping in the Patagonian wilderness. With treks sandwiched between paddling, you'll be able to visit Victoria waterfall and Lake Frey, and breathe in the lush atmosphere of the Valdivian rainforest. An introductory meeting will take place the day before the adventure begins, where you will have the opportunity to check your equipment and meet your guides. You will also have a safety talk and briefly recap the itinerary on the morning of day one, then be picked up from your lodging in Bariloche at 0900. 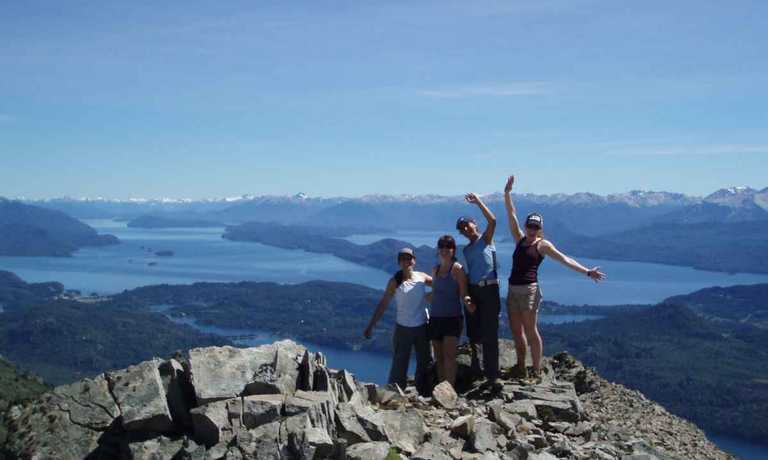 You'll transfer to the starting point at Lopez Bay (30 minute drive from Bariloche city). The paddling will initially be quite relaxed, as you make your way to Brazo Tristeza sound through a beautiful entry flanked by the Mounts Lopez and Capilla. Pass waterfalls and witness the snowcapped Mount Tronador and its glaciers come into view. 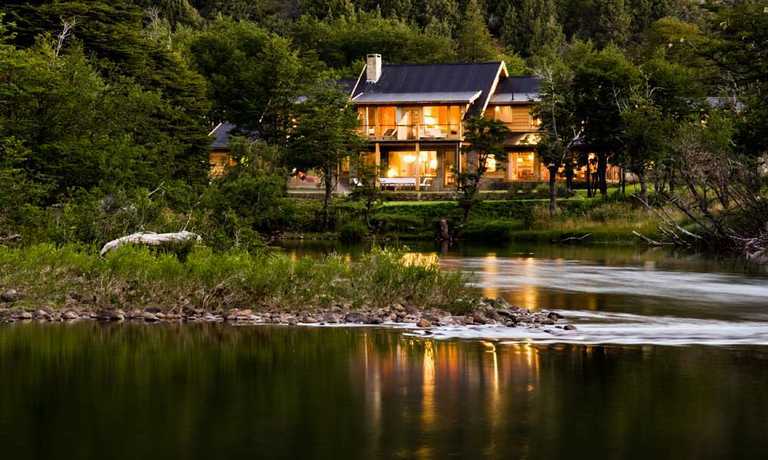 Listen to the songs of the Patagonian birds, filling the sky with an array of colours as they soar above. There will plenty of time to stop, relax and enjoy the surroundings. You will have lunch on a secluded beach, and then continue paddling, reaching your campsite. You'll have a few hours before evening to explore the local area, taking a walk, photographing the scenery/wildlife, or soaking up the views of the surrounding mountains and lakes from the sandy beach. After a tasty and hearty breakfast and some free time, you'll pack up your gear and paddle on to the far end of Brazo Tristeza sound. Here you'll embark on a relaxed yet fascinating walk up the banks of River Frey, to an impressive waterfall and granite toboggans. The area is in the verdant Valdivian rainforest, home to species such as "pangue" (Gunnera tinctoria) with its gigantic leaves, bamboo-like "cana colihue" (Chusquea culeou), and one of the world's southernmost conifers - "alerce" (Fitroya cupressoides). See the enchanting sprawl of climbing plants, growing in extremely rainy conditions in this area of the Andes. 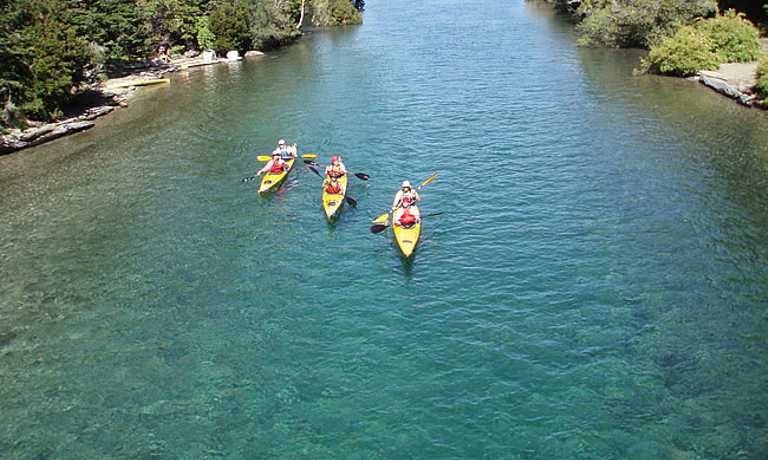 Back in the kayaks, you'll set out on the return trip along the opposite coast to continue sightseeing, kayaking and uncovering more of the wild in Nahuel Huapi National Park. 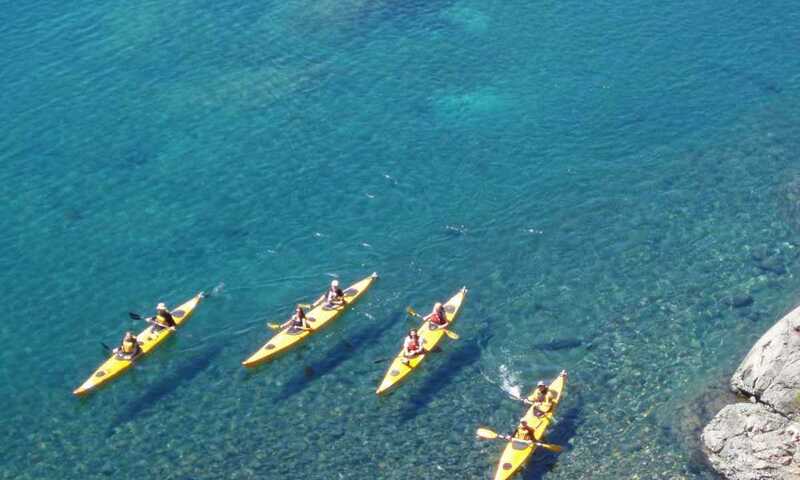 The kayak expedition ends at Bahia Lopez in the afternoon, and you'll drive back to the hotel in Bariloche. This trip can run as a group trip, with prices starting from $540 per person for a complete group. If you are looking to join a group or you are a solo traveller we will help to form likeminded groups of travellers. Please let us know your travel plans.